BELIZE CITY, Thurs. 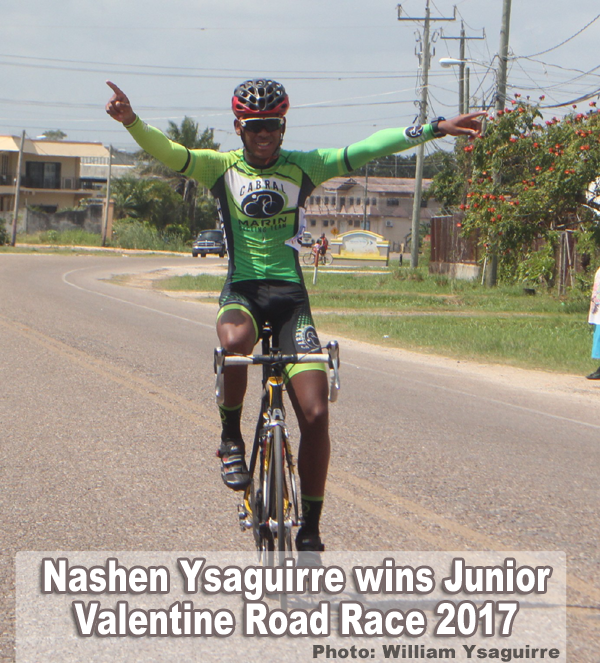 Feb. 16, 2017–According to the Technical Guide released by the Cycling Federation of Belize (CFB), the Digicell Valentine Tour, which covered three days of racing – Friday, Saturday and Sunday, February 10, 11 and 12 – was for riders in the Elite, Under 23 and Masters categories; while Female and Junior/Youth riders participated only in the Valentine Road Race Classic, which took place on Sunday, the last day of the Tour. A grueling three-day affair, the Digicell Valentine Tour comprised of four Stages: Stage 1 was the Individual Time Trial, a 12-mile ride on Friday, from Leslie’s Imports to Mile 8 and back; Stage 2 on Saturday morning was a 50-mile ride from Leslie’s to Data Pro through the Boom Road and back to Leslie’s; Stage 3 on Saturday afternoon was a 48-mile journey from Sandhill junction to Altun Ha cutoff through Maskall road and back to Sandhill junction; and the big Stage 4 Road Race was an 88-mile trek from San Ignacio to Benque Viejo then back to Leslie’s Imports in Belize City. Accumulated times were recorded for each rider from Stage to Stage, to determine the leaders with the lowest combined times at any Stage of the Tour. 47 riders took part in the Time Trial on Friday from Leslie’s Imports to Mile 8 and back, for 12 miles, and it was Mexican Rudy Rincon (Quintana) registering the best time (00:28:15), with a 30 second lead over second place Joel Borland (Digicell 4g Elite). In 3rd place was Brandon Cattouse (Smart/C-Ray Western Spirit); 4th was Mexican Juan Manuel Yapur (Team Yapurland); and 5th Giovanni Lovell (Digicell 4G Elite). After 50 miles or riding, 6 riders finished in a bunch to register the same best time of 2:01:43 in Stage 2. They were, in 1st place Richard Santiago (Benny’s Megabytes); 2nd Nissan Arana (Westrac Alliance); 3rd Joel Adan Borland (Digicell 4G Elite); 4th Geovanni Choto (Imani’s Team); 5th Ron Vasquez (Smart/C-Ray Western Spirit); and 6th Pedro Choto (Imani’s Team). With the combined finishing times registered in the first two Stages, the new Tour leader, with a 45 second lead on the next rider, was Joel Borland (Digicell 4g Elite); 2nd was Ron Vasquez (Smart/C-Ray Western Spirit); 3rd Nissan Arana (Westrac Alliance); 4th Rudy Rincon (MEX, Quintana); and 5th Geovanni Choto (Imani’s Team). With only a few hours’ recovery time, the 48-mile long Stage 3 followed, with a huge peloton crossing the finish line to register the same time of 1:44:38. 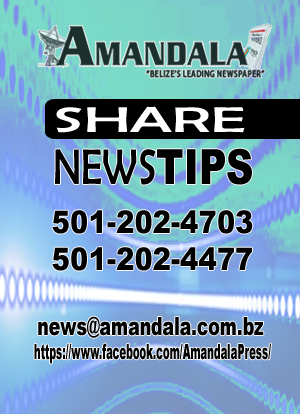 Top finishers were: 1st place – Erwin Middleton (Digicell 4G Elite); 2nd Brandon Cattouse (Smart/C-Ray Western Spirit); 3rd Fitzgerald “Palas” Joseph (Lampaz); 4th Kenroy “Smokes” Gladden (Kulture Megabytes); and 5th Mark Staine (Smart/C-Ray Western Spirit). More importantly, the new configuration, after combining times from all 3 completed Stages, then showed the Tour leader was still Joel Borland, who maintained a 45 second lead on 2nd place Ron Vasquez; 3rd was Nissan Arana, who was 7 seconds behind Ron. The finals leg of the Tour, Stage 4, was on Sunday, and saw 43 riders start and 27 complete the grueling 88-mile journey. Top finisher in this Stage 4 Road Race was young Tarique Flowers (Benny’s Megabytes, 3:57:37) who crossed the finish line 5 seconds ahead of a large peloton of some 20 riders, all registering the same time of 3:57:42. In 2nd place was Brandon Cattouse (Smart/C-Ray Western Spirit); 3rd Darien Anderson (Benny’s Megabytes); 4th Joslyn Chavarria, Jr. (Digicell 4G Elite); and 5th Mark Staine (Smart/C-Ray Western Spirit). 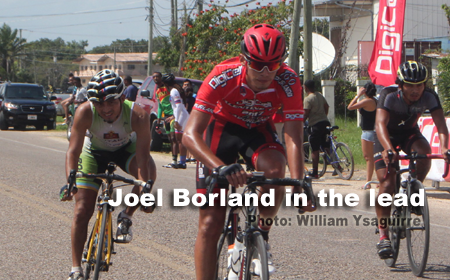 But Joel Borland was right in there with that peloton, and when all the numbers were tabulated for the overall general classification, he maintained the Tour lead to emerge as the Digicell Valentine Tour Champion with a margin of 45 seconds over second place Ron Vasquez. Final figures for the top 10 Tour finishers were: 1st place – Joel Adan Borland (Digicell 4G Elite, 8:12:45); 2nd Ron Vasquez (Smart/C-Ray Western Spirit, 8:13:30); 3rd Nissan Arana (Westrac Alliance, 8:13:37); 4th Geovanni Choto (Imani’s Team, 8:14:18); 5th Brandon Cattouse (Smart/C-Ray Western Spirit, 8:14:47); 6th Juan Manuel Yapur (MEX Team Yapurland, 8:14:56); 7th Tarique Flowers (Benny’s Megabytes, 8:15:00); 8th Giovanni Lovell (Digicell 4G Elite, 8:15:02); 9th Oscar Quiros, Jr. (Smart/C-Ray Western Spirit, 8:15:37); and 10th Richard Santiago (Benny’s Megabytes, 8:15:42). 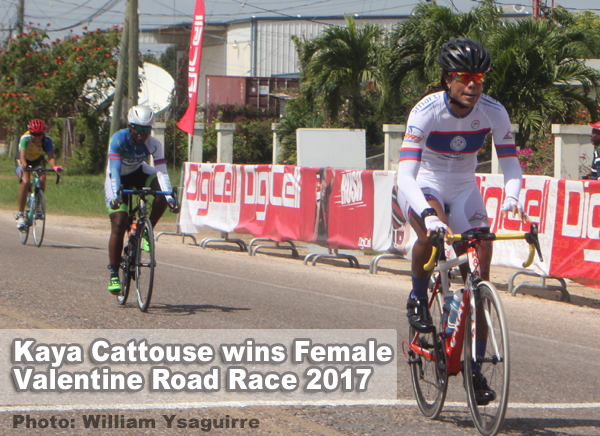 The female cycling rivalry continues between the two premier female cyclists, and in the 48-mile Valentine Road Race from Roaring Creek to Leslie’s Imports in Belize City, it was Kaya Cattouse (C-Ray Cycling) winning the 3-female sprint to the finish line, edging Alicia Thompson (Belize Bank Swoosh), who took second place, and Patricia Chavarria (Chavarria Cycling), who was third. All three clocked 2:48:58 for the journey. In 4th place was Taralee Ordonez (Belize Bank Swoosh, 2:55:57); 5th was Kaylynn Gillett (Belize Bank Swoosh, 3:04:13); and 6th Alicie King (Belize Bank Swoosh, 3:08:23). Two other female riders did not finish the race. 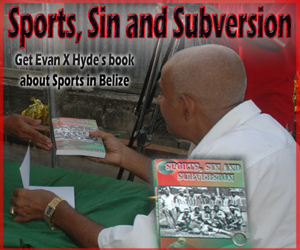 The Junior/Youth Valentine Road Race travelled from Central Farm to the finish in Belize City, for 65 miles. Some 36 riders started, and 27 completed the race. Crossing the finish line in solo fashion for the win was Nashen Ysaguirre (Cabral/Marin Cycling, 2:56:10). A 3-man group followed a few minutes after, with 2nd place taken by Gian Lino (Cabral/Marin Cycling); 3rd was Darnell Augustine (WKC Strikers); and 4th Carlton Robinson (WKC Strikers), all clocking 3:00:21. In 5th was Tevin Chaplin (Imani’s Team, 3:04:01). 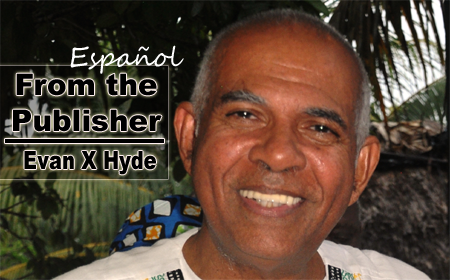 Top Youth finishers were: 1st place – Jyven Gonzalez (Imani’s Team, 3:07:00); 2nd Gian Lovell (Digicell 4G Jr. Team, 3:07:00); 3rd Derrick Chavarria (Chavarria Cycling, 3:08:52); and 4th Joseph Tillett (Cabral/Marin Cycling, 3:10:15).